Click/tap here to find the best Connecticut fishing charter for your needs! 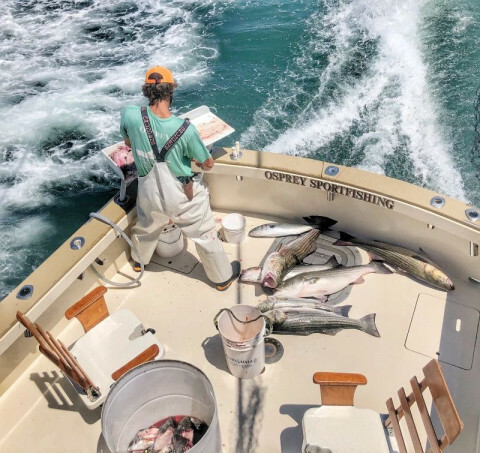 Whether you are planning your fishing trip from Connecticut, Rhode Island, New York or Massachusetts, you have found the premier charter fishing service for Eastern Long Island Sound, Block Island, and Montauk. Get ready for the fishing trip of a lifetime with Captain Jay and Osprey Fishing Charters. Our fishing charters offer excitement, fun, and lots of fish on the high seas. All trips are accompanied by a professional first mate, which will provide instruction, hands-on help and will fillet and bag your catch. All bait and tackle are provided for your trip. We use custom-built rods and high-quality reels.